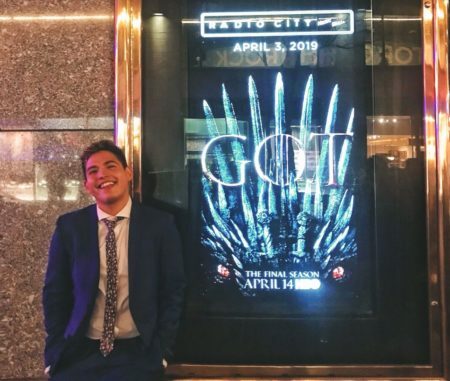 When I first accepted my role to be a brand ambassador for HBO, never in a million years would I have imagined that it would lead to me being flown out to NYC to attend the final premiere of one of the most culturally prominent shows on television. In February, the account manager for HBO told every brand ambassador throughout the country that HBO was initiating its #CreateForTheThrone campaign to create excitement for the last season of “Game of Thrones.” The campaign was simple: convince college students to create anything Game of Thrones related (art, skits, DIY thrones, etc.) and if HBO liked the creation, they would be flown to the premiere at Radio City Music Hall. To ensure that brand ambassadors would be engaged in this campaign, HBO told us that the top two performing BAs would be flown out to NYC for an all-expenses-paid trip to the premiere. Since Game of Thrones is my all-time favorite show, I knew I had to demonstrate my best abilities as a brand ambassador. Week One: I began posting consistently on social media about the contest. Everyone who followed me was WELL aware of this contest by the end of this week. Week Two: I planned to branch out from my circle and tried to promote the contest at DePaul’s student center. Problems arose when the student center would not allow me to post posters because HBO was not DePaul affiliated. Luckily, I convinced my fraternity, Alpha Kappa Psi, to be a sponsor and soon enough posters were plastered throughout the campus. I messaged various film/TV professors to let students know about the contest and requested other DePaul social media pages to post as well. While I was doing this, I was in constant contact with my account manager asking her what else I could do to promote this awesome contest. I managed to get one of my fraternity brothers to make a submission and he sent in a Game of Thrones inspired magic trick. My account manager was ecstatic with my performance throughout the contest. The next thing I know, I am flying to New York, being taken to a hotel in the middle of Times Square in a limo and feeling like a star. When I went to the HBO office to pick up my ticket, I was able to network with HBO professionals and thank them for this tremendous experience. All night long I watched the entire cast of Game of Thrones on the red carpet and enjoyed the first episode of the last season before anyone else. I sat in my seat mesmerized by the fact that this all occurred because I communicated with my account manager and did the best I could to promote this show that I adore very much. While I can’t give any spoilers of how the episode goes (HBO would feed me to the dragons if I did), I can say that winter is here and it will blow your mind. Becoming a Brand Ambassador: Riddle & Bloom is constantly looking for active student leaders to promote brands on college campuses so if you are interested in becoming a brand ambassador for amazing brands like Amazon and HBO, sign up here and let them know I sent you! Arturo Echevarria is a soon-to-graduate senior studying Public Relations and Advertising at DePaul University. Skilled in social media management with an immense knowledge of pop culture, he is looking to secure an entry-level position in a PR agency with affiliations in the entertainment industry.